What’s So Special About the iPhone X? 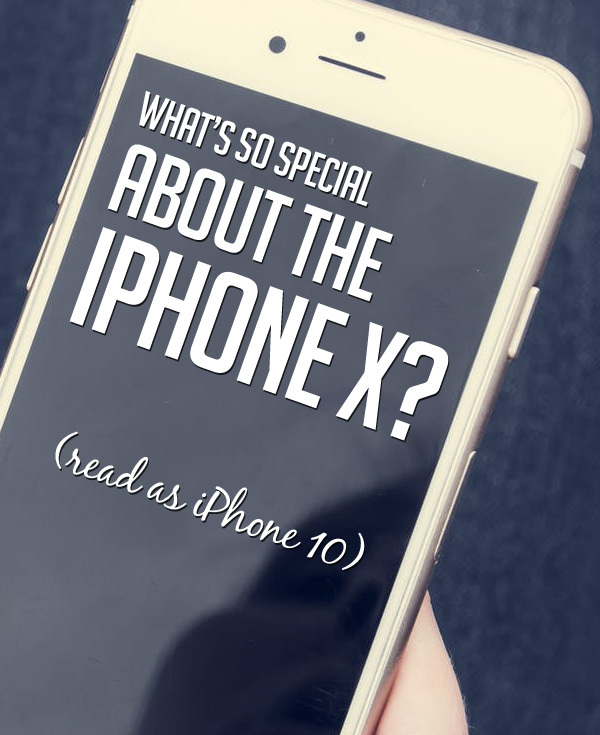 That’s the question the world was asking in November 2017 when iPhone X (read as iPhone 10) became widely available. The launch of Apple’s 10th anniversary iPhone was accompanied with unparalleled hype. The press and the media were rife with speculation, both negative and positive. Could any smartphone be worth the X’s asking price? More screen estate. Because iPhone X features an all-screen Super Retina display, there’s more space to display content and create more immersive experiences. The screen is the same width as iPhone 7 (375 points) but is 145 points taller (812 points). The 20% added space gives designers more room for an extra row of content or the addition of a menu. One caveat– it’s a good idea to use safe area layout guide or template to avoid image clipping at the rounded edges and around the sensors in the notch. OLED Display. The new edge to edge 5.8-inch display is OLED (organic light emitting diode). Colors are more accurate, vibrant and bright and the blacks are perfect. Burn-in is a concern of the past. Unlike LCD displays, OLED displays do away with backlighting. Each individual pixel produces light directly making it possible to control brightness at the pixel level. Facial Recognition. Chances are you’ve probably heard about the notch at the top of the X’s screen. It houses what Apple calls the “True Depth Camera System.” It makes possible Apple’s new Face ID. Instead of using a fingerprint sensor to unlock the X, True Depth maps the user’s face as authentication. Just looking into your X will unlock it. Entering a passcode will also unlock it. New Camera. The X’s camera is a 12-megapixel dual telephoto lens camera with wide angle f/1.8 and telephoto f/2.4 apertures. The new “portrait mode” allows users to blur the background and vary the lighting conditions. And with a six-element dual lens, even low-light shots turn out pretty good. Dual image stabilization makes for jitter-free stills and video. For many, the iPhone X is all the camera they will ever need. Super-Fast Performance. The X comes standard with Apple’s new six-core A11 Bionic processor along with 3GB of RAM. What this means is that it’s really fast. On paper, it blows away any other smartphone and even many laptops. There’s no lag or latency and the only hold-up you’ll ever encounter is the speed of your internet connection. No Home Button. Apple’s ubiquitous home button is gone. Many critics thought this would be difficult to get used to, but many early adopters report that it’s not a problem. The new gestures Apple uses to navigate the interface seem quite intuitive. Instead of pressing a home button, a swipe up from the bottom and the home screen or applications screens magically appear. There are several other new gestures to learn in order to navigate around, but all are easily mastered. To accommodate wireless charging, iPhone X now comes wrapped in glass. The X’s all glass construction makes it more fragile than iPhone 6 or 7. So, here are a couple of tips for protecting your X and making it last a long time. Buy a good case and don’t leave home without one. It would be foolish not to protect the substantial investment you’ve made. There are literally hundreds of cases for iPhone X. Be choosy and select one that has earned four or five-star reviews. You’ll be glad you did the first time you drop your X. Use a screen protector. The glass face on the X is fairly durable, but over time it could get scratched and marred. Screen protectors are fairly inexpensive and will keep your X pristine. But don’t just take our word for it, expert reviews agree, there’s a lot to like in the iPhone X. Manage and protect your Apple devices in minutes! Comments to What’s So Special About the iPhone X?